Chewy, sweet, wholesome and satisfying. These cereal bars are great for kids and adults alike. They are packed with whole grains, heart healthy omega 3's, lots of fiber, and an array of vitamins and minerals. They are great for an afternoon snack or as a quick breakfast on the go. Looking for a perfect post-workout munchie or an after school treat for the kids? Look no further- you've found your recipe. I love bars. Granola bars, protein bars, cookie bars, the list goes on. They're portable and delicious. Unfortunately many of the bars out there aren't the best choice if you're trying to reach for a healthy snack. Most are filled with refined sugar and hydrogenated oils. Even worse are the fruit filled garbage disguised as a quick, healthy breakfast. 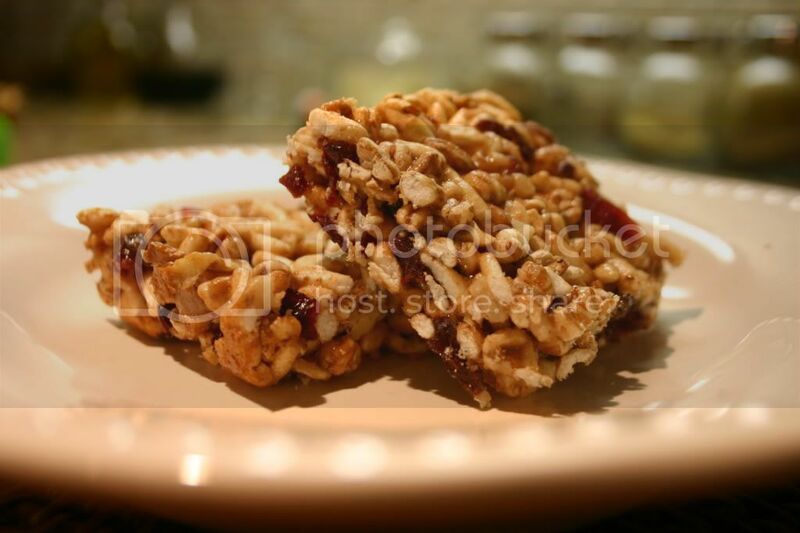 These cereal bars however, are great because they are full of nutritious little goodies like dates and walnuts. The sweetness comes from honey, brown rice syrup and dried fruits. The protein from walnuts and nut butters. Whole grains come in the way of puffed cereal, lending it's delightful chewiness to these snacks. It goes without saying that kids love treats like this. My son was begging for a bite before he even knew what it was. They just look good. And since they taste great and are good for you, you can't go wrong. I recommend making a double batch, they will disappear before you know it! Brown Rice Syrup- is produced from brown rice that has been ground and cooked. It has the consistency of honey and is about half as sweet as sugar. It has a flavor profile similar to a less sweet butterscotch. Since it is made from malted grains, brown rice syrup retains some of the nutrients found in the whole grain as well as complex sugars which take longer to digest, which means it does not cause the huge spike in blood sugar as with refined white sugar. Its glycemic index is a 25 compared to 64 in white sugar and 96 for pure glucose. You can substitute brown rice syrup in recipes that call for corn syrup. Lundberg makes a non-GMO, organic, gluten free brown rice syrup called Sweet Dreams, which is what I used in this recipe. Spray 9" square metal pan with nonstick spray. Mix cereal, walnuts, dates, cherries, and raisins in large bowl. Combine nut butters, honey, and brown rice syrup in a small saucepan. Bring to a boil over medium heat, whisking constantly until mixture bubbles and thickens slightly, about 1 minute. Pour over cereal mixture and stir until cereal is well coated. Press into pan and bake until golden around the edges, about 10 minutes. Store at room temperature in airtight container for 3-5 days, if they last that long! * I love buying my dried fruit at Trader Joe's. If you have access to one, I recommend going there to buy all your nuts and dried fruits. Their selection and price can't be beat!